Ten days into the Trump administration, the word "authoritarian" is popping up all over the media. It is seeping into newspaper columns, TV segments and political discourse. Critics on both the left and the right are warning about President Trump's behavior, saying it signals creeping authoritarianism. Some of them are wondering if the new president has autocratic tendencies; others are alleging it outright and saying that he is eroding American democratic norms. The cover story in March's edition of The Atlantic, a magazine well-read in Washington, is titled "HOW TO BUILD AN AUTOCRACY." Conservative Trump critic David Frum is the author. The magazine's editor-in-chief, Jeffrey Goldberg, said he was publishing the article a week early, on Monday night. "Given the precipitous quality of this past weekend's executive order, I thought that David's piece ought to be read sooner, rather than later," he told CNN. Some of the concerns stem from the Trump administration's constant media bashing. On Sunday Trump senior advisor Kellyanne Conway asked, not for the first time, why journalists and commentators who underestimated Trump haven't been fired. And the president went out of his way to call the media the "opposition party" in a tweet on Monday. "Those of us who've studied authoritarian regimes know that the first step is you want to intimidate people who'd be saying things that the leader doesn't want to hear," CNN presidential historian and former Nixon library director Tim Naftali said on "CNN Tonight" last week. Trump supporters may dismiss all of this as anti-Trump panic. But the discussions are not just happening in the usual circles. 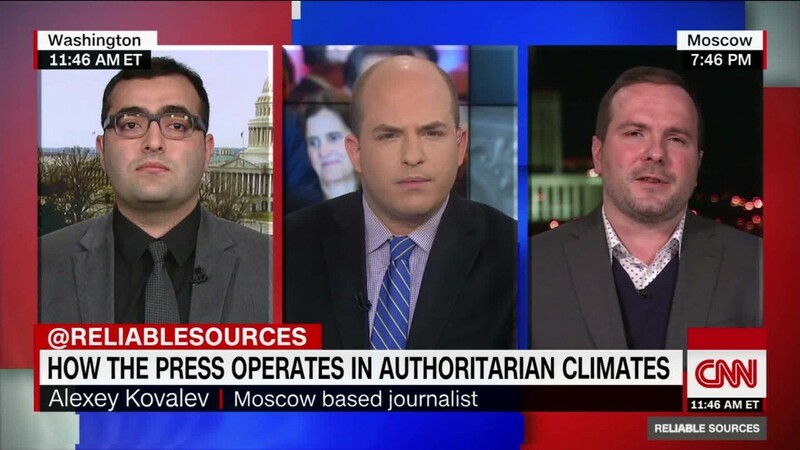 "Anecdotally, I'd say that journalists are starting to recognize the authoritarian tendencies of this administration and to be more explicit about the risk of democratic erosion in their coverage," Dartmouth political science professor Brendan Nyhan, who has been frequently sounding an alarm about authoritarianism recently, told CNN. "One key factor," Nyhan said, "seems to be the growing number of conservatives and former Bush officials who are speaking out, which helps make clear that these concerns aren't just partisan or ideological opposition to Trump." Russian-American journalist Masha Gessen jump-started the conversation in November, right after election day, by writing an essay, "Autocracy: Rules for Survival," for the New York Review of Books. Last week on MSNBC, she said "just fact-checking everything" Trump says "doesn't quite go far enough. I think we have to understand the power play. We have to understand the aesthetics of using language so that it turns into mush. We have to keep writing in the bigger story and keep trying to understand the truth." Last week Evan McMullin, who ran for president as a conservative alternative to Trump, said the anti-media attacks are "what authoritarians or leaders with authoritarian tendencies do. It's from the playbook that they use." Over the weekend libertarian-minded billionaire Charles Koch, without citing Trump by name, said at a conference that the United States could "go the authoritarian route ... or we can move toward a free and open society." In a widely-shared column, Bush administration official and longtime Trump critic Eliot Cohen wrote that Trump's behavior "will not get better. It will get worse, as power intoxicates Trump and those around him." He predicted that it would "probably end in calamity." Other observers who see authoritarian tendencies, like author and CNN host Fareed Zakaria, are hopeful that Trump's impulses will be tempered by institutions like the courts. Much of the current commentary is centered around getting Americans to recognize the risks. "We have a president who seems to be an authoritarian," progressive CNN commentator and former Obama administration aide Van Jones said at the Women's March on January 21. Before inauguration day, NYU historian Ruth Ben-Ghiat wrote an op-ed for CNN.com called "Trump is following the authoritarian playbook." And the late-night comedian Seth Meyers, who regularly uses his NBC program to lambaste Trump, said "Trump's hostility toward the press is the kind of thing you usually see in authoritarian regime." This was a topic on Sunday's "Reliable Sources," the program I host on CNN. "Whenever I look what President Trump and his team are doing here in the U.S., I'm like, 'Wait a second. I have seen this movie before.' It's all familiar to us," Turkish journalist Mahir Zeynalov said on the program. "And I'm not talking about a country like Iran or China, where autocrats are crushing or strangulating the media. I'm talking about Turkey, a country that was somehow democratic a decade ago, with a somewhat independent media, and now turning into a state where there's at least one journalist being put behind bars since last summer, on average, every day." Zeynalov acknowledged that the U.S. has "strong institutional mechanisms," but said that backsliding is still possible. "If there's anyone who is saying that this cannot happen here in the United States, they are significantly underestimating how leaders, including in democratic countries, can undermine media freedom, and, with that, democracy," he said. Google search data for the term "authoritarian" shows increases in queries in 2016 and 2017 versus prior years. Amazon's list of best selling books also suggests an increase in interest in the subject matter. The Sinclair Lewis novel "It Can't Happen Here," about a gradual fascist takeover of the U.S., joined George Orwell's "1984" on Amazon's best seller list over the weekend.